The Ashley is quite confused: Why are they showing us recycled clips again, when there is a wedding about to happen! Shouldn’t this be about the time they are showing up Jinger’s held-in-a-barn bridal shower, thrown by that wacky, bug-eyed party planner Sierra? The Duggars live for weddings (and babies), yet they aren’t taking advantage of all the wedding planning and making episodes full of new footage with it?! Maybe ol’ Jing actually put her (bare)foot down and forbid the camera crew from filming the events leading up to the wedding? We watch as all the helpers (aka the women willing to spend hours making bells out of tissue paper in order to see their grinning mugs on The TV for about 15 seconds) prep for the wedding. 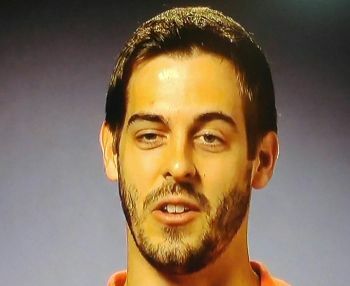 There’s a montage of Jill and Derick’s chaperoned dates (and, of course, a plug for that weird taco place again), before we are forced to re-watch the footage of Jill and Derick getting engaged. Next, Jim Bob hovers over the couple to make sure their mouths don’t accidentally touch before they are married. They’re acting like this is all new footage. “Stay tuned for Jill’s first kiss!” a banner flashes before one commercial break. Really, TLC? Stop it. You’re just embarrassing yourself…. 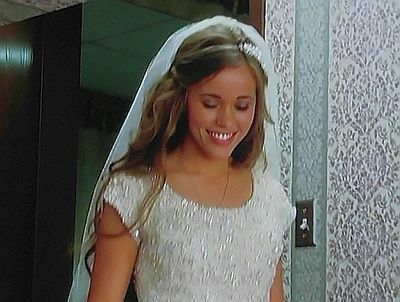 We watch as all the Duggar girls have their [incredibly gorgeous] hair curled for the big day. It’s easy to forget how nice Jill’s hair was before she had to wash it in jungle swamp water. 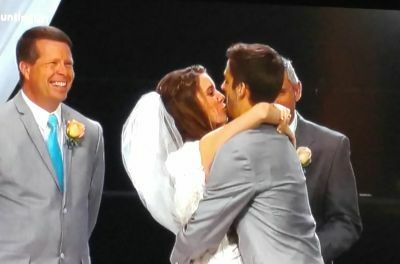 Anyway, Jill and Derick head down the aisle and say their “I do’s” and then we get to watch poor Jill awkwardly launch her lips at Derick for the first kiss…only to miss! That’s a rewindable clip if there ever was one! They clomp their way back down the aisle, and run through the entire church, meeting rooms and all, for some reason. 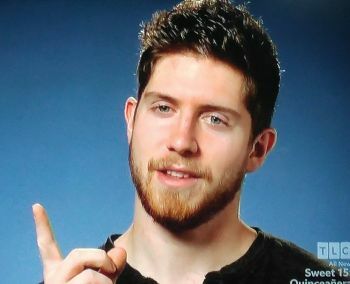 During this clip, Derick explains what’s happening, Ben Seewald-style. 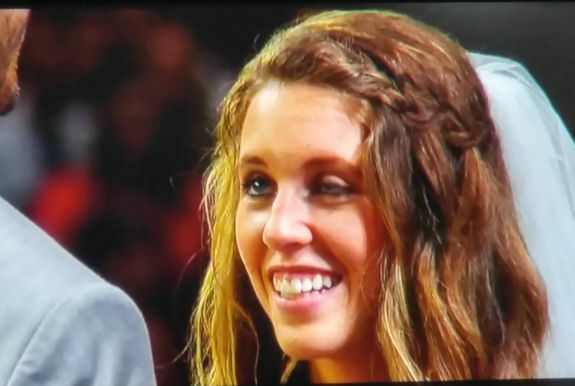 Jessa can’t even force herself to stare adoringly at Ben, even though it’s kind of required that all Duggar women do that while their man speaks. She just hangs her head in shame as Ben speaks gibberish. Speaking of Jessa and Ben, it’s next time to stroll back through their wedding day. 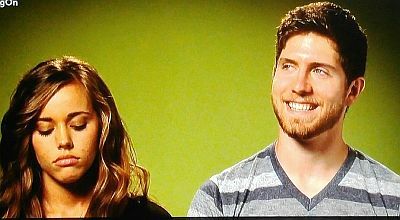 They take us through Jessa and Ben’s engagement (again! ), and the wedding prep. Sierra appears with her gang of Arkansas tissue bell makers to make sure the event goes off without a hitch. 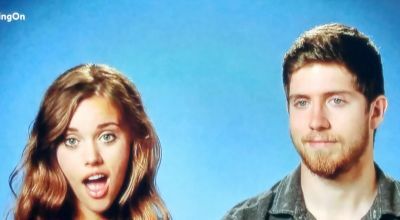 We watch the clips of Ben and Jessa’s rehearsal dinner, where a sobbing Jinger has just realized that Jessa will no longer be by her side at the Duggar Compound to wrangle siblings and help make the tater tot casserole. In between Jinger’s sobs, Ben amazes us with his idiotic quotes about love and marriage. Next, it’s time to show the wedding day (again). Jessa arrives and Sierra hurries her off to be prepped, Soon, she emerges, and all the gals ooh and ahh at her, while dreaming of the day that it will be them walking down the aisle to a 19-year-old with an IQ of 11. Jessa really did look stunning, though. 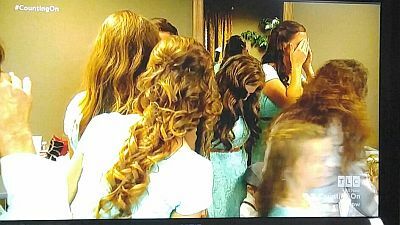 The girls line up, and each take a turn bugging out their eyes toward Jessa as they head into the church. Finally, Jessa heads down the aisle, as the Bates girl bangs out “Here Comes the Bride” even more painfully for Jessa than she did for Jill. We listen to the preacher talk about “Ben-jeer-men” and Jessa joining together and…well…actually, I have no clue what else he was talking about. I zoned out on everything except for when the preacher mispronounced Ben’s name. Finally, they say “I do” and it’s time for the Big Kiss. As you may remember, though, Ben-jeer-men and Jessa decided not to let everyone gawk at them having their first kiss. They had the first kiss in private, away from the cameras and preacher who couldn’t even pronounce the groom’s name. Of course, Michelle can’t let a wedding episode pass without bringing up the day she and Jim Bob got hitched. Unfortunately, for Michelle, there’ s no more time to discuss more weddings. That’s all for the episode! Somehow they managed to make an entire new episode without even a second of brand-new footage. 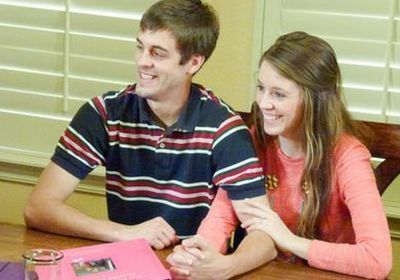 Well played, Duggars, well played. To read our recap of last week’s episode of ‘Counting On,’ click here! What’s up with this horse teeth woman’s eyes?? That headline picture is glorious ????? Jill looks like that creature from The Goonies. Thank you for making me crack up in public as I read this so people think I’m nuts!!! LOL I just deleted this one because I could not sit through those weddings again. And I thought I was the only one who noticed the preacher call him Ben-jer-man the entire wedding!!! My husband and I still laugh about that to this day! I can’t stand Jessa but her dress was stunning. Jill and Derick’s first kiss was so awkward! No wonder Jessa and Ben chose to have their first kiss in private. I love this show, but even I’m getting tired of all the clip shows! WHO WATCHES THIS STUFF!? Apparently they don’t have enough material and it’s just looking back at wedding and babies. I’m hoping its cancellation time soon. I doubt the rating are good. I only have watched half of one episode I just read your recaps. Much more entertaining.